Microsoft CityNext is a people-first approach to innovation that empowers government, businesses, and citizens to shape the future of their cities. People-first means harnessing all the ideas, energy, and expertise of a city’s people as they create a healthier, safer, more sustainable place to live. Microsoft offers a broad a portfolio of secure consumer-to-business software, devices, and services; a vast network of global partners; and a history of successful education and social programs, all of which, when combined, help cities with what’s next. 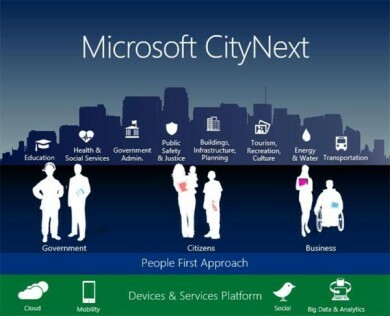 CityNext enables cities to operate more efficiently and serve citizens as “One City” across eight critical functions: energy and water; buildings, infrastructure, and planning; transportation; public safety and justice; tourism, recreation, and culture; education; health and social services; and government administration. Microsoft and its partners are committed to helping citizens, businesses, and governments realize this vision through a new era of innovation, including: Cloud, Mobility, Social, Big Data. The Microsoft big data solution offers an end-to-end platform to manage any data, of any size, from any source, with our industry-leading database services. 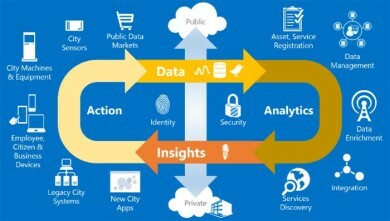 CityNext solutions aims to deliver a holistic, citywide view and give employees new intelligence that supports better historical trend and pattern analysis, richer predictive modeling, and more effective real-time decisions, all of which help a city optimize its resources, break through departmental silos, and provide better services for less.